BE BOLD This International Women’s Day! The rallying cry for International Women’s Day-the day when women’s power and accomplishments are celebrated throughout the world-is #BeBoldforChange. In honor of this special day, SI/Santa Clarita Valley, CA’s (Camino Real Region), club president, Suzanne Stone, reached out to SIA with an exciting proposition. 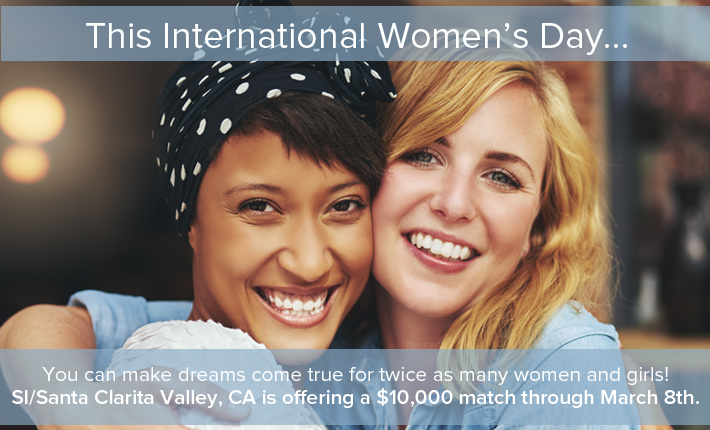 If Soroptimists collectively raise $10,000 by 11:59pm on March 8-International Women’s Day—SI/Santa Clarita Valley will match every penny! SIA is an amazing network of women—we can do this—Be BOLD and make your gift today, which will fund our life-changing Dream Programs. Together we can make dreams come true for women and girls by providing access to education through our Dream Programs. The organizers of International Women’s Day ask: “What if the world truly stepped up to take bold action?” Take that step, BE BOLD, and give today! 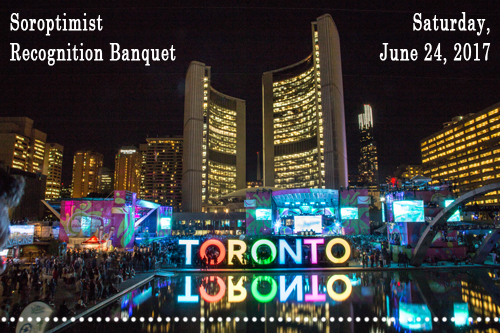 Registration for the 2017 SIA Recognition Banquet is now open! Join Soroptimists from all over the world for a fabulous evening to celebrate our accomplishments and our leaders! Visit the SIA Meetings webpage for more information to plan your trip to beautiful Toronto! Check out the FY16/17 key messages talking points. Topics include: Our Organizational Change Strategies, Donations Fund Our Dreams, The Return on Investment of Membership Dues, and Participating in SIA’s Dream Programs. Positive and inspirational messages of support collected from LiveYourDream.org supporters! password protected the curriculum to ensure we know who is using the curriculum. You will still have easy access to Dream It, Be It materials via the member Sign In page, where you will need to enter you member username and password. Each member’s username is you six-digit member ID number. Each member’s initial password is their six-digit member number. Members can update their member profile/change their password here. Does your club have a Dream It, Be It event planned for the near future? Please let headquarters know! To help show our impact, SIA is gathering photos of club Dream It, Be It events, and if permitted, will possibly send a professional photographer to your event. Email Communications Manager Kamali Brooks at kamali@soroptimist.org if your club has an event coming up soon. Clubs that submitted applications for club grant funds can expect to hear back about the status of their application by the end of June 2017. Last month, April Hernandez-Castillo joined up with LiveYourDream.org and encouraged supporters to join the movement to end teen dating violence. April is a motivational speaker, author, and actress from shows such as Law & Order: SVU and Showtime’s award-winning Dexter. But April is more than a celebrity. She’s a survivor of teen dating violence who now travels the nation encouraging young women to break free from abuse, claim their voice, and live their dreams! Watch her video and consider making a pledge to end teen dating abuse. And remember—our Dream It, Be It program addresses teen dating violence by targeting girls who may be vulnerable. Help us fund the delivery of this program. Region Leaders: Ready to Assist Clubs With Recruitment! Some of the most experienced recruiters and membership experts in our federation are represented in our region leadership. Do you know who is your 2016-2018 Region Membership Chair? You can look up her contact information by logging in to the directories on the SIA website. She can help you lay out a membership strategy to assist in your recruitment and engagement efforts, or aide in the creation of a new club! Our Ability to Come Together! What makes Soroptimist unique and powerful is our ability to come together. Belonging to a team is a result of feeling part of something bigger than YOU and working toward a common goal. As Soroptimists, we are focusing on our Big Goal of Increasing Our Collective Impact. When we come together to do this, we empower our members, engage them, and increase our ability to serve more disadvantaged women and underserved girls through our Dream Programs. 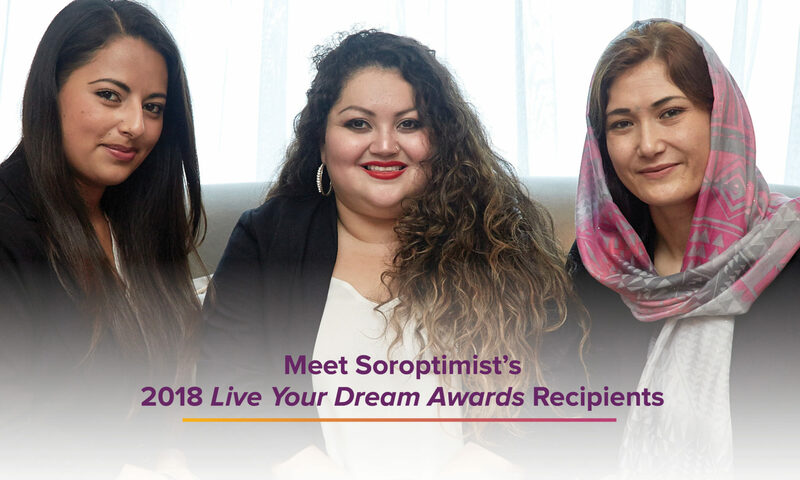 Want to enhance the Soroptimist spirit in your club? Read this team building article today! Members give us one of your most precious gifts—time! Because this is such a valuable commodity, offering flexible ways to be involved in your club may be just the key to keeping members on the fence about renewing their membership. Check out this resource and consider how your club can be more accommodating in order to create a healthy atmosphere! Since its launch in July 2015, members and clubs in SIA have donated nearly $150,000 to the SI President’s Appeal, Educate to Lead Nepal. Your generous donations support educating women and girls in Nepal to help them rebuild their lives following the devastating earthquake in 2015. Thank you! Show your love for Soroptimist with this newly designed heart pin (gold tone—item #112 and silver tone —item #113). Shop the SIA store today to get yours before they sell out!